Lynn Kozak, an associate professor in McGill University's Department of History and Classical Studies, performs a weekly, one-person production of Homer’s The Iliad at Bar des Pins in Montreal’s Plateau Mont-Royal. Each week Kozak translates, memorizes, and performs between 45 minutes and an hour of text. Over the 30 weeks of the production, she will be working with a different director for each installment. The performances are also accessible online at: https://previouslyontheili.wixsite.com/iliad. 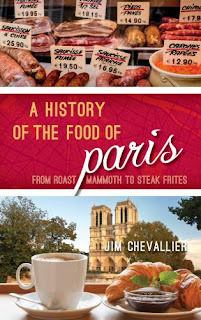 Kozak generously agreed to speak with the Historical Cooking Project about her project, public history, and the role of food and drink in this classic text. 1. One thing that has struck me while watching your performances is the role of food in The Illiad. I never noticed the frequency of the descriptions of food and drink before when I read translations of the text but their inclusion is very apparent during the performances. What do you see as the significance of food and drink in the text? 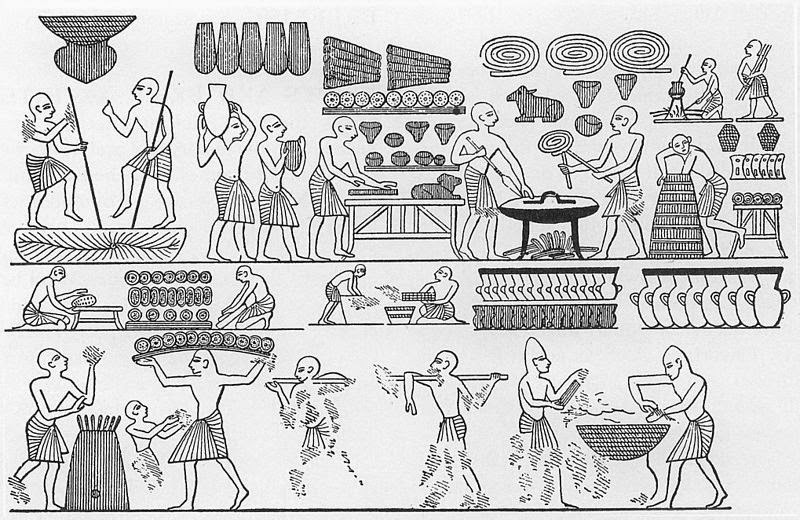 Meals mark out the passage of time, but are also deeply tied to ritual, as sacrifices to the gods naturally precede meals of meat, while every meal must always be preceded by some offering to the gods. 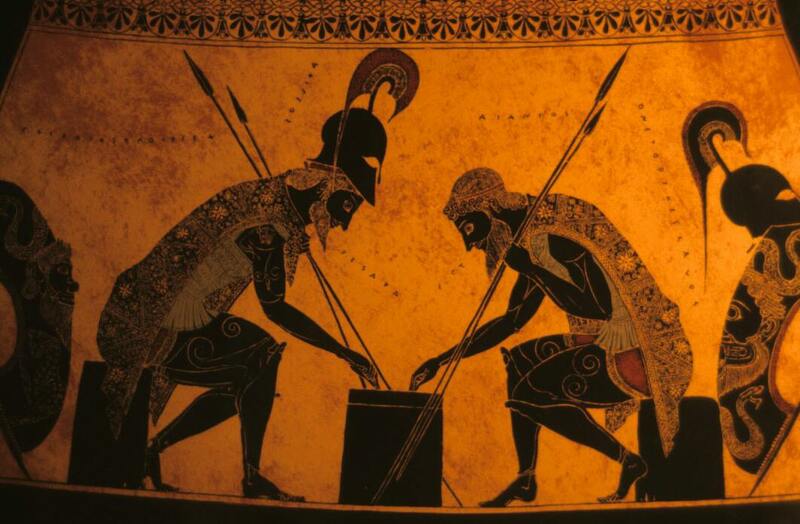 The Iliad's warriors also closely link food and drink to their own battle strength, so [they] think about their meals in terms of performance. More, status is marked out by what kind of food you are offered or able to offer, so the men who are the best warriors and who rule the most men get the best cuts of meat and get to drink the most wine. I think it's closer to how these stories would have originally been experienced- we don't have a lot of evidence of ancient performance, but in the Odyssey the epic bard Demodokos sings his stories during a feast. I think it's important for the audience to have a social sense of one another, and it's important to me as a performer to be with the audience. Epic is not theatre, and never has been, so the idea of a theatre space just never really came up for me. But yes, it's a shame that we lose young people for our audience. 3. During your performances, audience members are eating and drinking (mostly drinking). How do you think that changes the nature of the performance? I love it- as I said above, I think it brings out the communal experience of the story, that we're all enjoying this story together, and that it's something we're all doing together- I would hate it if everyone was sitting still and silent in the dark and I couldn't see them- for me, this is a story I want to share with friends, and among friends. 4. Homer's works have been translated numerous times. In 2011, a New Yorker article claimed that when you read a translation of a text like The Illiad, the individual priorities and biases of the translator are most apparent. Similarly, the 2017 New York Times article on Emily Wilson's translation of The Odyssey noted that "the fact that it's possible to translate the same lines a hundred different times and all of the m are defensible in entirely different ways? That tells you something." How do you approach your translation? How do you translate words for which there are several meanings? Or no direct meaning? How does this relate when you are translating passages relating to foods that may no longer exist in contemporary times? I'm just trying to make the story as clear and as contemporary as possible, which I'm sure is true for many other translators too! I'm not doing a metrical translation, so that helps me in trying to get the story across, not having that constraint. If there's a North American idiom that fits with an ancient Greek one, I'll translate the phrase into that- I'm more concerned with making sure the audience is with me than trying to create something unique or poetic. The food issue is funny because I've actually struggled most with cuts of meat- this week, we've got a pork "chine", which is the backbone- we've also had cuts of meat "along the back", which we figure are the tenderloins, since they're being given to the highest status warriors. Then there are processes like fig juice curdling milk, presumably to make a kind of cheese- that's a simile in the Iliad about how fast Paian heals Ares, so the poet thinks his audience is familiar enough with that process to understand how quick it is. 5. How do you make dining rituals comprehensible for modern audiences as you are not only translating a language but also translating cultural practices? 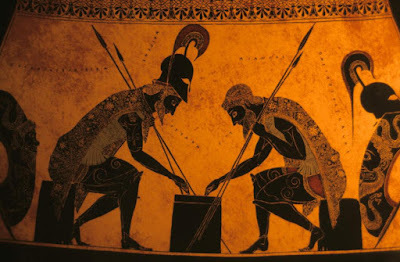 They're very detailed in the Iliad, so I think the audience gets used to them, the cutting of the meat, the roasting, the offerings to the gods- mixing wine, pouring some out to the gods- these things are repeated over and over and they make the world alive for us. 6. Your performances do not just highlight the role of food, but you are also making the text digestible for a wider audience. When you later complete your written translation of The Illiad will this also be a goal for you? Or is your goal to work on multiple levels to connect with different types of audiences? 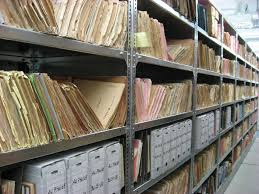 I'm interested in capturing the needs of performance in my written translation, so keeping that clarity that I need when I'm telling the story to people face to face on the page, so that no one should have to look up anything. A lot of the issues with translating from Ancient Greek is that the dictionaries themselves haven't been updated much since the 19th century, so you almost have to translate the language twice, once from ancient Greek and once from 19th century English. I want just want it to be as clear as possible, without throwing away any of its beauty. Most untranslatable words I keep untranslated, especially words like pepon, affectionate terms that you call another person. Over time, I think the audience gets an ear for words like this, and I think that that would carry over on the page. Translators like Anne Carson often leave the Greek interjections or pet words like this intact, and I think it can be effective if they're explained from the get-go. 7. I have heard you rehearse in the ancient Greek and translate later. I have SO MANY questions about this technique but to keep it short: how does this impact your relationship with the director for that week? Is the director then working with someone else's translation when they come up with the concept (I am assuming they do not all read ancient Greek themselves)? Do you find that the run time in the Greek and in English is similar? Does the feel and tone remain quite similar between the two languages? I don't actually rehearse in ancient Greek, I just only work from an Ancient Greek script, so every rehearsal produces a new, more refined oral translation. My stage manager, Alex Martalogu, is always on the Greek text, but my directors don't have ancient Greek. Some directors choose to keep another English translation on hand so that they have a text to work from; some just listen to me and take notes. A couple times this has affected director's visions, because some directors can get very attached to language when they're doing text work with a different translation, so then it's a negotiation with them working with my translation instead of the one they've been reading, but it also means that we can find a translation tone and style that works with their concept, which is a huge advantage of not working from a fixed English script. In terms of length, we go at about 10 lines a minute, which is fairly consistent with Ancient Greek performance, though we have no idea how music might have affected the pace in the ancient world. The joy of doing the whole Iliad has been paying more attention to the details like the meals and the rituals, things that I've often skimmed over because they're not "essential" to the story, but they are essential to the storyworld, and I feel so grateful to have this opportunity to really experience this whole storyworld. That gratitude extends to my collaborators and to my audience (and to the FRQSC! ), all those who are helping me bring this story to life and living through it with me. served a little more next time, and I think that appeals to these fans.